At the launch of God Bless Archie Dean are David Shaughnessy, Niamh Cummmins, Terri Smith, Daniel Jackson, Mairead McCann and Evan Browne who will be performing in the show. 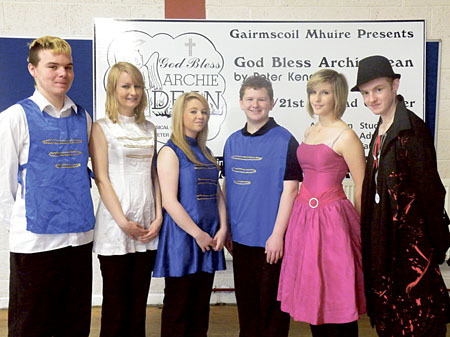 REHEARSALS ARE currently in full swing for Gairmscoil Mhuire, Athenry Vocational School’s musical production of Peter Kennedy’s God Bless Archie Dean. The comedy musical will be performed in the school gymnasium on October 20, 21, and 22 at 8pm. The show centres on Archie Dean, who, having died in a train crash, faces the dilemma of making up his mind as to where he would like to spend eternity. Archie’s story unfolds through a musical that not only makes audiences laugh but also makes us think about the underlining message of the struggle between good and evil in all of us. Archie enters Hell (a mistake he thinks ) having committed a sin he did not confess and is met by the devil’s sidekick, the hilarious Toby, who tells him that he has not been bad enough to enter Hell, which leaves only one option - purgatory! Toby makes a deal with Archie; he is given one month to return to earth, during which he must commit a mortal sin so he can earn his entry to Hell. He finds it hard to keep up his side of the bargain, however the Angel Gabriella and St Peter intervene time and time again to try to save Archie. The show is written, composed and directed by Peter Kennedy assisted by the school’s music teacher Anne Lynn and art teacher Bernie McGonigle. Shane Farrell is the musical director. Admission is €12 (adults ), €8 (students ), and €30 (family ticket ). Tickets are available from the school (091 - 844159 ) and may also be purchased on the night.